The remains of four supernovas in the nearby Large Magellanic Cloud galaxy provide a dazzling display of one of nature's most explosive events. These X-ray images show multimillion degree gas that has been heated by shock waves from the explosions. Moving in a clockwise direction from the upper left to the lower left, the approximate ages of the remnants are 600 years, 1500 years, 10,000 years and 13,000 years, respectively. Chandra X-ray spectra provide important clues as to how these stars exploded. 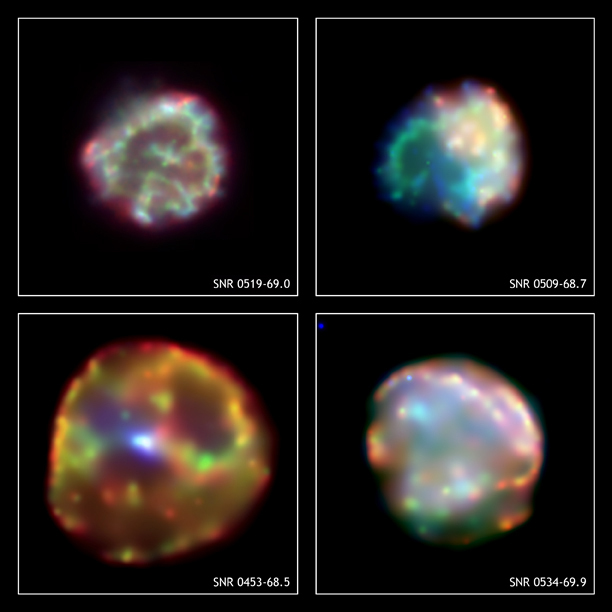 The remnants on the upper left, upper right and lower right show a concentration of elements typical of a Type Ia supernova. Such an explosion is triggered when matter is pulled from a companion star onto a white dwarf star and pushes it past the limit of stability. The ensuing thermonuclear explosion completely disrupts the white dwarf star. 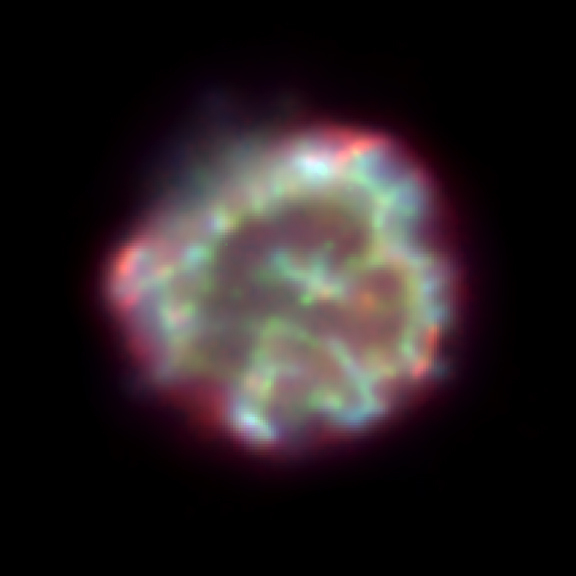 In contrast, the supernova that produced the remnant SNR 0453-68.5 left behind a neutron star. This indicates that a Type II supernova occurred when the nuclear power source of a massive star became exhausted and the stellar core collapsed to form a neutron star, while the outer layers of the star were blown away. The rapidly spinning neutron star is ejecting a magnetized wind of extremely high-energy particles, which appears in the image as the elongated, bright blue-white spot at the center of the remnant. Scale Image is 1.85 arcmin per side. Coordinates (J2000) RA 05h 19m 34.90s | Dec -69º 02' 07.30"
Scale Image is 2.4 arcmin per side. Coordinates (J2000) RA 05h 09m 03.90s | Dec -68º 43' 19.00"
Scale Image is 8.7 arcmin per side. Coordinates (J2000) RA 04h 53m 40.00s | Dec -68º 29' 45.00"
Scale Image is 8.8 arcmin per side. Coordinates (J2000) RA 05h 34m 00.00s | Dec -69º 55' 00.00"